Another summer weekend, passed by in a haze of cookery, faffing and generally quite a bit of jolly good old-fashioned fun! My fun, of course, involved the cooking side of things. 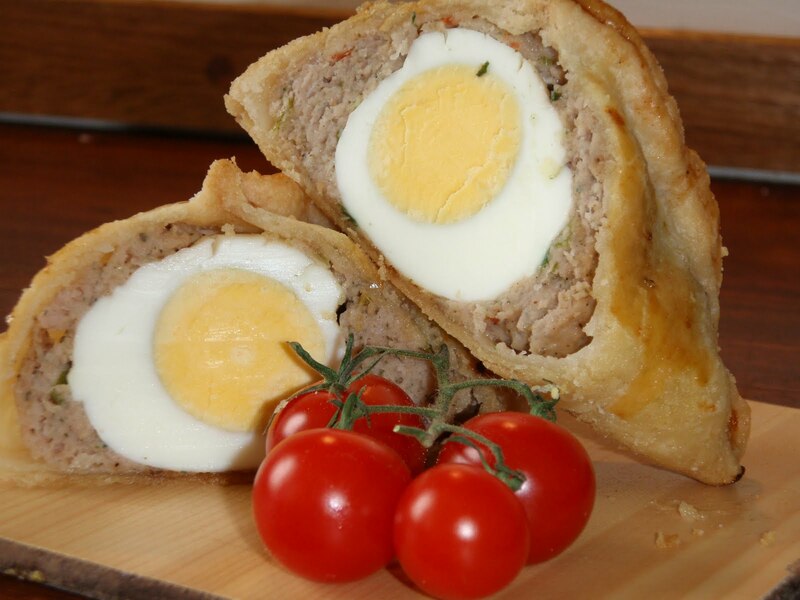 I have been wanting to know how to make Scotch Eggs for a while and actually only discovered quite recently (to my horror) that they are deep fried!! 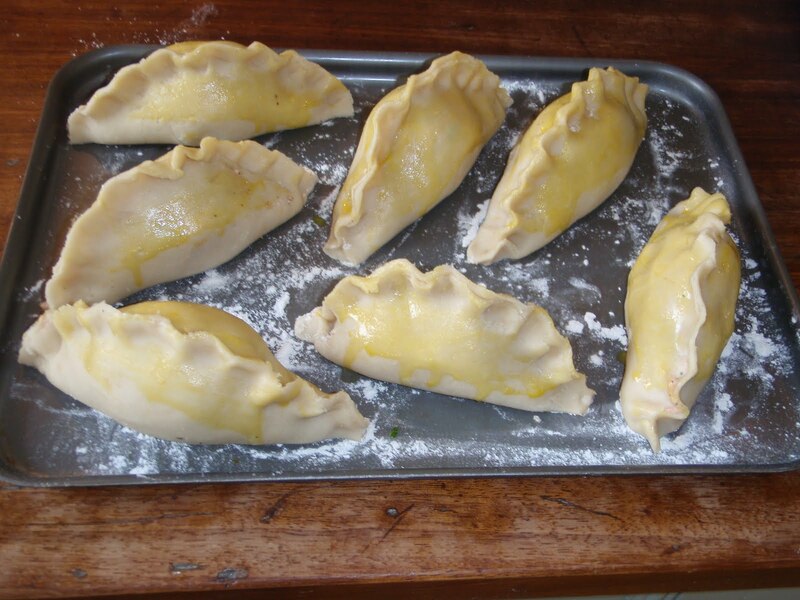 So, when i saw the ‘Scotch Egg Pasties’ on the Good Food website – i obviously had to try them out. So, technically i can’t take the credit for this recipe, but i did add some extra bits and bobs that weren’t on the recipe, mainly due to the fact that i was only vaguely following it in the first place. Put the Eggs in a pan of water, bring to the boil and simmer gently for 5 minutes. Drain, refill the pan with cold water and leave the eggs to cool in that while you get on with the sausage. Heat oven to 200 degrees (if you haven’t got a fan then 220 degrees). Squeeze all the sausage meat out of the packet into a large bowl. Add the thyme, spring onions, peppadew pepper, Worcestershire Sauce and the seasoning. Squidge it all together, ideally with a hand, but i used a fork then a spatula to get it all off the sides of the bowl. Check it for seasoning – NOT by EATING it – but by smelling it, you’ll just get this mouth-watering sausagey smell that will make you so impatient to hurry up and cook these flippin’ things. Dollop and spread (almost to the edges) round a ball, ummm, bigger than a golf ball smaller than a tennis ball of the sausage mix. place an egg in the middle of each disk. 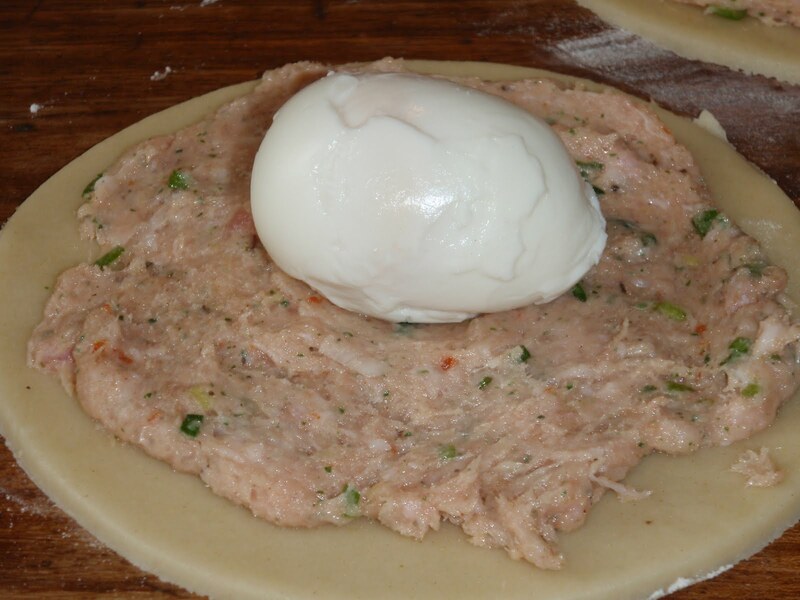 Wet the edges of each disk and gently pull the edges together and you will see a pasty shape being formed. ‘Crimp’ the edges. I’m not sure if that is a technical term but it involves putting the thumb and forefinger together on one hand and using the knuckle from the forefinger on the other hand. Place the thumb and forefinger together hand on one side of the stuck together edges and the knuckle on the other side and gently push together forming a relaxed v shape. continue this all the way round and it will look a bit like this. Now i really must say, that these smelt divine while cooking, were almost impossible to keep until the picnic (a mere 2 hours after cooking) and tasted utterly gorgeous hot and cold! !